Employers are concerned about increased health benefit costs arising from President Barack Obama's health care reform law but almost none intends to drop coverage for full-time workers next year, according to survey results released Thursday. The health care law's requirement that companies with at least 50 employees provide affordable health benefits is the chief reason most firms expect their spending on health insurance to rise in 2014, according to a poll conducted by the International Foundation of Employee Benefit Plans, an organization of human resources professionals. Nevertheless, more than two-thirds of companies definitely plan to offer health benefits to full-time workers, and just 0.5 percent said they definitely will discontinue coverage. More than 90 percent of companies surveyed currently offer health benefits to full-time workers. The health care reform law heavily relies on private companies continuing to be the most common source of health care coverage and aims to stem the ongoing decline in employer-sponsored health insurance. Obamacare seeks to build on the estimated 159 million people currently receiving job-based health insurance by mandating that larger employers offer coverage to workers or face penalties starting at $2,000 per employee. Major disruption of current health benefits or large numbers of workers losing their employer-sponsored benefits and shifting into the law's government-run health insurance exchanges could further undermine weak public support for Obama's signature domestic policy achievement. 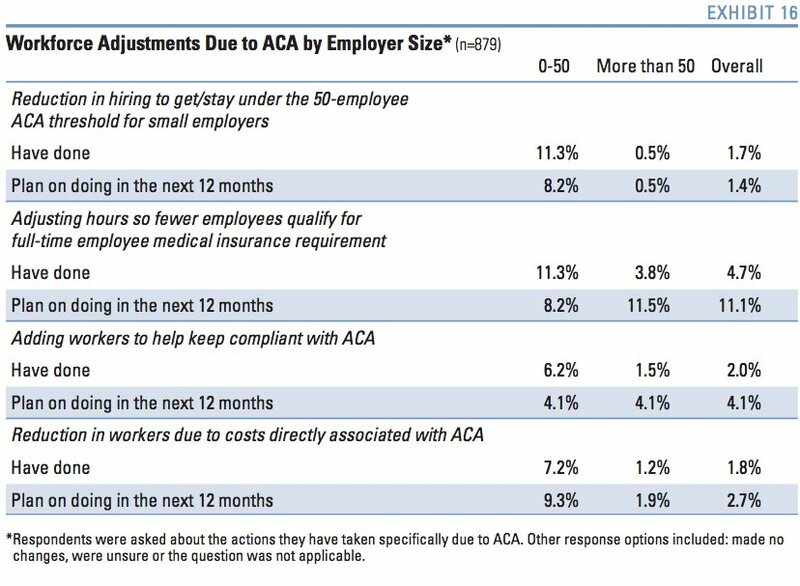 Based on the findings of the survey, these negative outcomes won't be seen in the near future, despite protestations from Republicans and some business owners that Obamacare would force many companies to cancel job-based health insurance. Fewer than 3 percent of companies surveyed reported they were at least somewhat unlikely to continue coverage of full-time employees. Since Obama signed the Affordable Care Act into law in March 2010, numerous surveys of employers have produced similar findings. As the law's provisions to expand health coverage to millions of people begin to take effect in 2014, employers are more likely to have concrete strategies in place to adapt to the changing health insurance marketplace, which includes new rules on what health plans must cover and what share of the premiums employers must pay. More than nine in 10 companies are past the "wait and see" stage of planning, and 52 percent have begun to institute changes in their benefits, according to the survey. Employers expect to keep providing health care coverage despite their conviction that the health care reform law boosts their employee benefit costs. The survey shows that 88 percent of companies already have seen spending increase because of provisions like the requirement that young adults can remain covered on their parents' plans until they turn 26. Additional rules that come online next year will further raise spending, employers reported. Businesses could opt to discontinue health benefits, or to encourage some of their employees to forego them and direct workers to shop for their own health insurance on the exchange marketplaces that will begin selling coverage for 2014 on Oct. 1. Workers who earn up to 400 percent of the federal poverty level, which is $45,960 for a single person this year, will be eligible for tax credits to defray the cost of insurance if they don't get it at work. Those whose income is below 133 percent of that line, or $15,282 for an individual in 2013, may qualify for Medicaid coverage in states that expand the program under Obamacare. Few companies are eyeing this alternative, however, the survey shows. 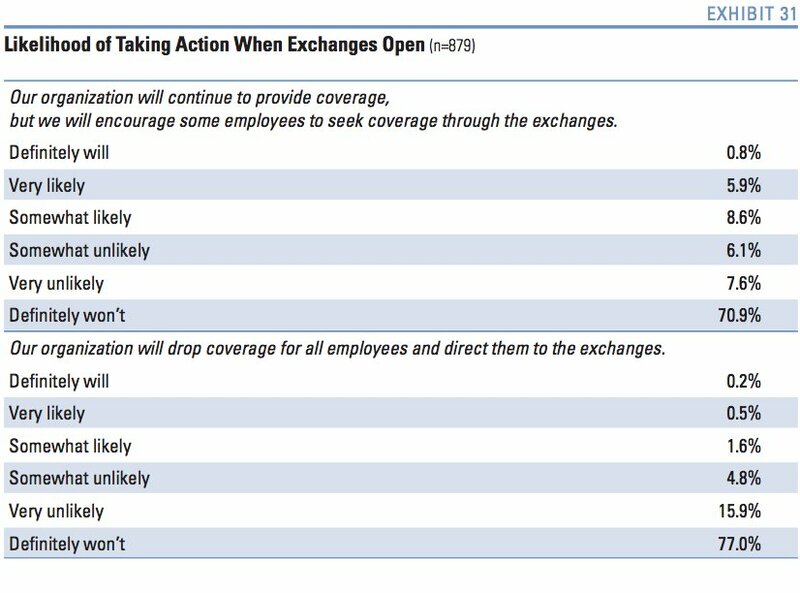 Seventy-seven percent of the firms polled definitely won't eliminate health benefits and lead their employees to obtain their own coverage via the exchanges, and less than 1 percent definitely will, according to the poll. Likewise, 71 percent of companies definitely won't push a portion of their workforces into the exchanges and less than 1 percent definitely will. Among those who do discontinue health benefits, more than two-thirds are at least somewhat likely to boost pay in trade. The health care reform law's "pay or play" requirement that companies either offer qualifying benefit plans or pay financial penalties, however, will affect hiring and the hours available to part-time workers, the survey shows. Almost 20 percent of companies with fewer than 50 employees has or will curtail adding staff to avoid triggering the so-called employer responsibility clause of the law. The same percentage has or plans to keep some workers below the 30-hour threshold that designates them as full-time. The health plans offered by the vast majority of these businesses already meet Obamacare standards for affordability -- 74 percent -- and for quality of coverage -- 81 percent -- the survey shows. 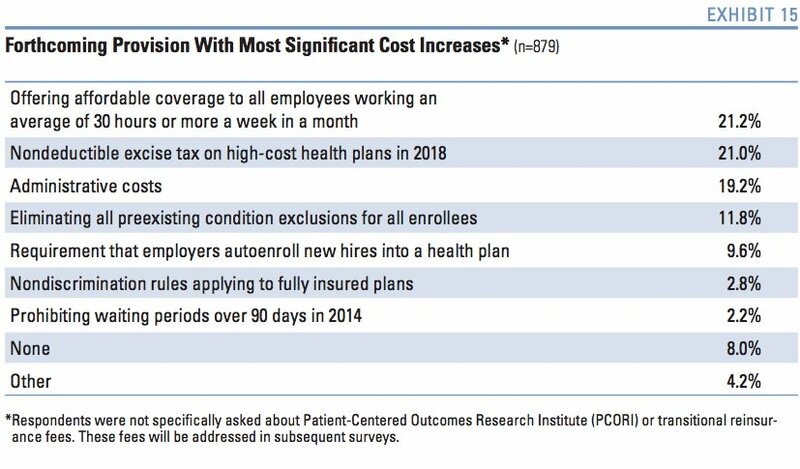 Still, some companies have taken steps to contain health insurance costs or to increase the burden on workers, and others intend to pursue such strategies in future years, according to the survey. Furthering ongoing trends that pre-date health care reform, employers are making changes to health benefits, such as making workers pay a larger share of premiums or increasing deductibles.